A convergence trade is a closed-end fund that is trading at a wider-than-usual discount and is likely to close that discount. On some occasions, the discount is warranted- most likely because they cut the distribution. Other times they are trading wide because of the sector being out of favor or general market weakness. 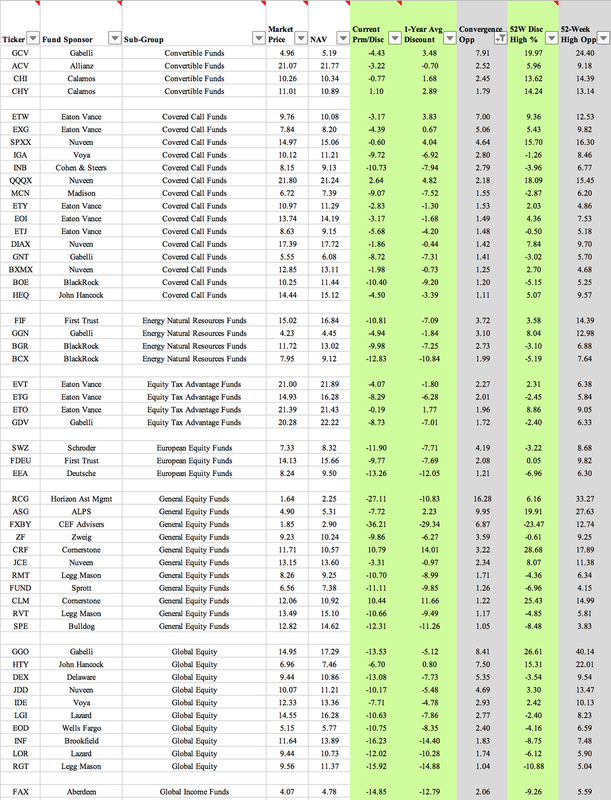 We look at our table to see those funds that are trading well below their 52-week average. We further inspect how far off the fund is from its 52-week high. Given the favorable Fed backdrop - basically a green light for CEFs- in general we think it is highly possible that they re-reach those 52-week highs in premiums. There is a lot of data below- do not be intimidated! The keys here are the two grey columns on the right side of the table. The "convergence opp" column (third from the right) shows the amount of potential discount closing if the fund were to get back to their 1-year discount (recall that we said we thought discounts could exceed their 1-year levels and approach 52-week highs). 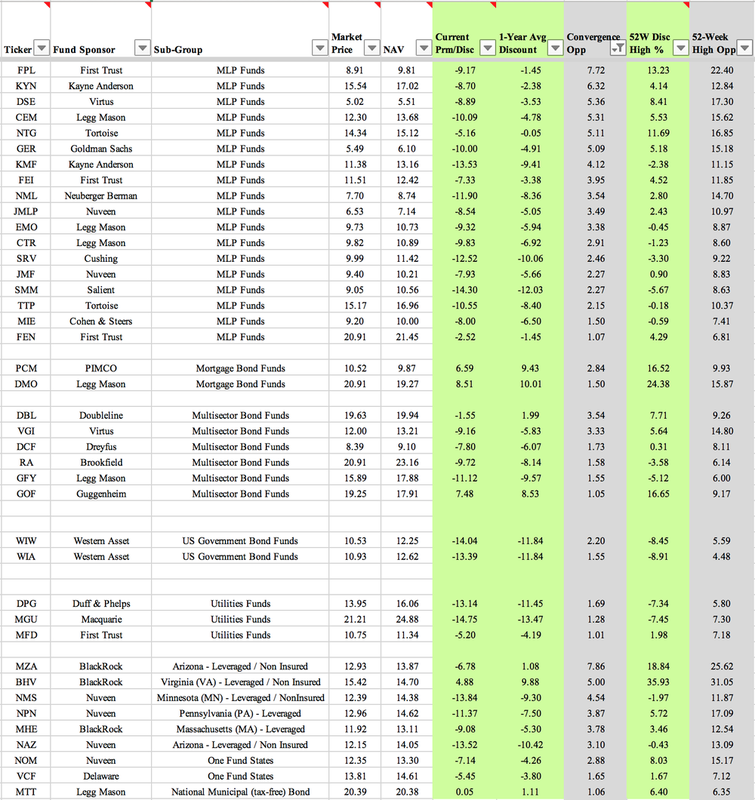 The second to last column (green labeled "52W Disc High %") on the right shows the 52-week high in discount/premium. The last column (52 wk High Opp) shows the amount of discount tightening that would be needed in order for it to reach those 52-week highs again. It is interesting to see the differences month-to-month in the chart. The list continues to shrink as the discounts tighten up. A convergence trade is a closed-end fund that is trading at a wider-than-usual discount and is likely to close that discount. On some occasions, the discount is warranted, most likely because they cut the distribution. Other times, they are trading wide because of the sector being out of favor or general market weakness. In the January Muni Market Update we had five funds that we said to 'buy today for the discount capture'. Blackrock Muni Income Inv (BBF). Below is MYF, which shows a strong V-shaped recovery in the last 7 weeks. How did we identify it? The yield was attractive enough at the wide discount for it to garner a bunch of interest from shareholders. Additionally, the fund had just cut and was unlikely to cut again. Third, the variance between the current discount and the average discount was substantial. Of the Blackrock funds, it was the only one that sold at a premium in the last twelve months. So there was a lot of pull for the discount to close.